The National Insulation Association (NIA) recently interviewed Bernie Markstein, U.S. Chief Economist for Reed Construction. Dr. Markstein has extensive experience in analyzing and forecasting commercial construction activity. He has a Bachelor of the Arts in Economics from Brown University and a Doctorate in Economics from Yale University. The following interview covers his thoughts on where the construction industry is headed and the factors that will affect the economic recovery. As we move deeper into the second quarter of 2014, questions remain about the economic recovery in general and how the construction industry will fare. Most indicators predict that the economy will continue to recover and the construction industry will also improve, though at a measured pace. Part of the slow pace of the recovery has to do with uncertainty about where government spending and taxes were headed in 2013. This uncertainty was a drag on investment and, consequently, on nonresidential construction—despite historically low interest rates. Simple government appropriations did not occur, and there were a series of continuing resolutions until the appropriations bill for the current fiscal year—which runs from October 1, 2013 through September 30, 2014—was passed and signed into law in January 2014. The government shutdown in October 2013 also had a direct impact on a number of government construction projects, delaying the start of many projects and in some cases stopping them altogether. Following the government shutdown and the eventual passage of an appropriations bill, there was also the threat of hitting the government debt ceiling. If the debt ceiling was reached—which, at the time, was expected to occur in spring of this year—there would have been a wider shutdown of government. The Treasury would have been forced to delay paying various federal obligations, such as Social Security, Medicare, federal payrolls, payments to contractors, tax refunds, and debt payments (a technical default of U.S. government debt). Fortunately, Congress passed legislation suspending the debt ceiling until March of next year. Although the debt ceiling issue was ultimately avoided, this created great uncertainty at the time and increased the reluctance of businesses to invest in an already uncertain economic environment with relatively weak demand. More directly, the weak economic recovery was hit with sequestration—across-the-board cuts in federal funding for most of the federal government, which had a significant effect on construction projects. Thankfully, we are now recovering from these events; some funding has been restored, and no new cuts are anticipated at this time. It is still necessary for Congress to act on legislation dealing with funding for construction projects. Without such multi-year funding, long-term planning, and contracts, the construction recovery will continue at a slower pace. Essentially, however, we are in a quiet period with government funding in place for this fiscal year and no immediate threat from the debt ceiling. This has removed some of the uncertainty for business planning and investment. Other factors affecting construction include a long and difficult winter—even now, parts of the country are just beginning to see the signs of spring. March total construction spending was only up 0.2% from February, though it looks like many of the projects that were delayed in the first quarter will take place in the second quarter. The forecasted overall employment numbers for May look positive, and growth is expected to continue in the coming month. This year, we are on track to move past the pre-recession peak in employment, which we are currently 100,000 jobs below. Ideally, we would be moving far beyond a peak from several years ago, but the fact that we are on track to reach the pre-recession peak is a good sign. Unemployment numbers are also decreasing—though this may be skewed by the fact that some people have given up on their search for employment. In the short term, it would be a good sign to see the unemployment rate temporarily go up—this would mean confidence in the economy was growing and people would rejoin the ranks of the unemployed (hopefully temporarily) while looking for work. A full and robust economy should see the addition of between 400,000–500,000 jobs a month, but even the addition of 200,000–300,000 jobs a month would be a good start. U.S. Census data measuring the past 12 months found that, on average, approximately 190,000 jobs were added per month, with 288,000 jobs added in April. The nonresidential building sector has had a more difficult recovery, with nonresidential construction spending falling for the past 5 months. While overall spending is 3.5% higher than the same period a year ago, the recent drop in spending is still a concern. Part of the decrease may have to do with the weather, but it is more likely tied to other aspects of the economic recovery. There has been an absence of funding for buildings such as hospitals and schools, which depend largely on appropriations from the government. Education construction fell for the fifth month this year, and is 5.5% lower than it was this time last year. Health-care construction is also down 6.5% from last year. 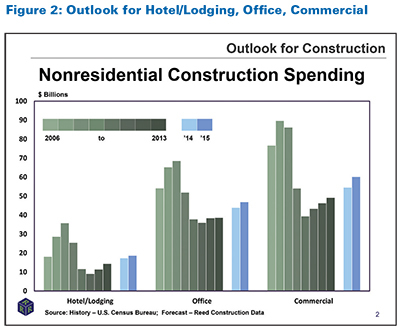 Other commercial (mainly retail) nonresidential building has improved, up 8.7% from this period last year, with office construction up 12%, and lodging up 33.7%. While these latter projects can be funded privately, there has been a hesitancy on the part of government to fund the types of institutional projects that would have further aided the construction recovery by spurring institutional construction such as educational and health-care facilities. 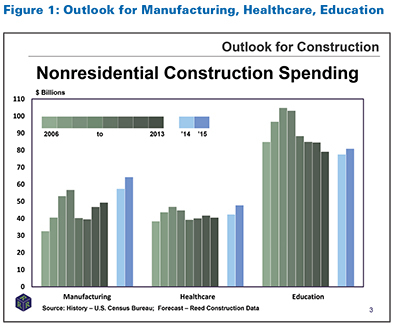 Overall, however, the forecast is positive, with U.S. nonresidential building construction spending in 2014 predicted to increase 4.3% over 2013, and 2015 spending expected to increase 8.6% over 2014. 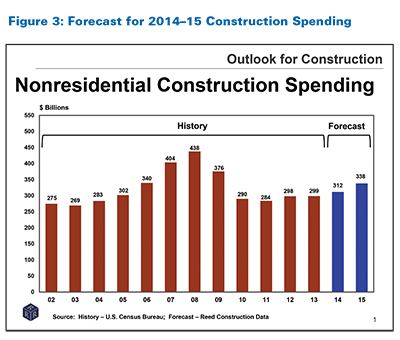 To see the construction forecast for each sector, reference the graphs on pages 24–25. The breakdown of projects by state is available in the charts to the left. Infrastructure repairs are a huge category that has the potential to spur many construction projects and add construction jobs. Sewer and water treatment facilities desperately need updates, and although the forecast does have spending going up for water and sewer projects in 2014–2015, this increase will not be sufficient to offset all the repairs that are needed. The power sector will also be in need of updates, and we see spending going up for this in 2014, and then more significantly in 2015. Overall, the main issue that holds back spending is the conflict in government over federal spending. With different political parties in disagreement over proper taxation, and the associated appropriations for construction projects like these, the outcome for these projects remains to be seen. reliable infrastructure, high worker productivity, shorter distance between manufacturer and selling market, and high availability of energy, we are seeing some American companies coming back to the United States, as well as other foreign companies showing interest in building their factories here. This could bode well for a variety of construction industries as demand for manufacturing buildings increases. facilities in particular has been in reverse for a number of years and is expected to bottom out next year, with the potential for improvement in 2016. Overall, however, the forecasted growth for both residential and nonresidential building is looking up, which will increase demand for insulation and for the services of mechanical engineers. This issue is also complicated by the fact that certain companies may be reluctant to hire workers who have been out of work for a significant period of time—even if they are qualified. There may also be an unwillingness to hire older workers, though they likely have the skill sets and knowledge that companies need. In response to this shortage, there have been some efforts to create the education needed to generate more skilled workers, particularly at community colleges. Labor unions can also be a potential source of education. It may prove worthwhile for companies to join together and create consortiums to train workers. Joining together has the benefit of diluting the cost, and could provide the infusion of skilled workers that the sector desperately needs. Of course, any consortium must be sure to avoid violating any anti-trust laws, which is easily accomplished with proper planning. Though there will be difficulties and growth may at times be slow, the construction industry is forecasted to recover in the coming years—it is crucial that we develop the workforce to ensure the industry’s growth is not hindered. There have been some efforts to create the education needed to develop the skilled workers that the construction industry needs. San Antonio, Texas in particular has responded to this need by establishing the Construction Careers Academy (CCA) which offers 4 “strands” that aim to give students the education they need for careers in architecture, construction management, engineering, and the trades. Students may specialize in carpentry, HVAC, pipefitting, plumbing, welding, or electrical work. It has become a very popular program, and 505 eighth-grade students have applied for the 159 available spots in the upcoming freshman class. In total, the program has 475 students. 3 Educational programs like the CCA can play a tremendous role in creating the workforce that will be needed as the construction industry continues to recover and demand continues to grow. Other groups have also been investing in educational programs. The Associated General Contractors (AGC) of St. Louis created the Construction Careers Charter High School, which was the first publicly funded high school for construction in the United States. Another organization, the Associated Builders and Contractors (ABC), Central Ohio chapter, created a public charter high school for construction. This 4-year program uses a combination of online courses, classroom learning, and on-the-job training. 1. Andrea Wells, “Construction Obstruction” Insurance Journal 92, no. 1 (2014). 2. Kelly Davidson, “Industry Seeks Answers to Increasing Labor Shortages” ENR.com (2014). This article was published in the June 2014 issue of Insulation Outlook magazine. Copyright © 2017 National Insulation Association. All rights reserved. The contents of this website and Insulation Outlook magazine may not be reproduced in any means, in whole or in part, without the prior written permission of the publisher and NIA. Any unauthorized duplication is strictly prohibited and would violate NIA’s copyright and may violate other copyright agreements that NIA has with authors and partners. Contact publisher@insulation.org to reprint or reproduce this content.